The New Jersey Amber is true Amber, not Copal, and dates from the late middle Cretaceous Period (roughly 90 million years old). We were fortunate enough to visit last year with a local collector who goes by the name “Hopper”. Hopper explained that the most of the amber he collects comes from the surface of a large clay pit in the center of the town. A combination of frequent excavations, prior mining activity, and natural forces have resulted in a scattering of mostly pea sized amber pebbles across a flat surface. 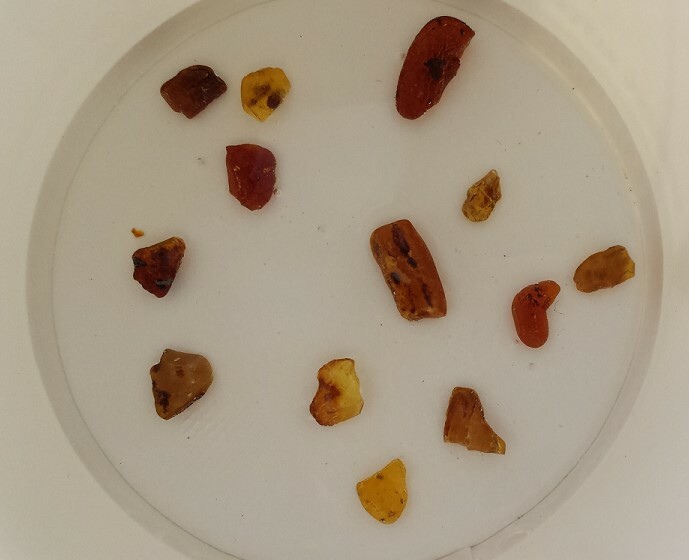 Hopper provided us with several samples of the Amber he’s collected along with a string of beads that he polished and drilled from the tiny amber pebbles. The amber comes in a variety of colors from clear a yellowish honey amber to a dark brown nearly opaque amber with heavy inclusions. Some of the prettiest pieces are a gentle reddish yellow. All of the amber pebbles have an oxidation crust on the outside that prevents their real beauty from coming through. It can be easily polished off or the pebble can be placed in water. The water temporarily hydrates the oxidized crust and creates the illusion of polish. 2. The amber is more brittle than other amber we’ve encountered. So far, the leading ideas are: 1) to use them like branch pearls in a sculptural brooch or pendant (possible an Egyptian style bird); 2) to partially submerge them in acrylic over engine-turned sterling silver plank and then cut the plank into triangular earring faces; 3) to simply drill them as is and hang them from 14K gold wire as hook earrings. We would greatly appreciate any other ideas or design suggestions. vol. 97 no. 25 (This is a peer reviewed paper that discusses a “worker ant” found by the author in a Sayreville Amber specimen. The intended audience is scientifically oriented people. It’s not impossible to get through for the lay person, but not an easy read either). This entry was posted in Musings / News and tagged Amber, Amber Jewelry, Dominican Republic, Jewellery, New Jersey, New Jersey Amber, Sayreville New Jersey. Bookmark the permalink.